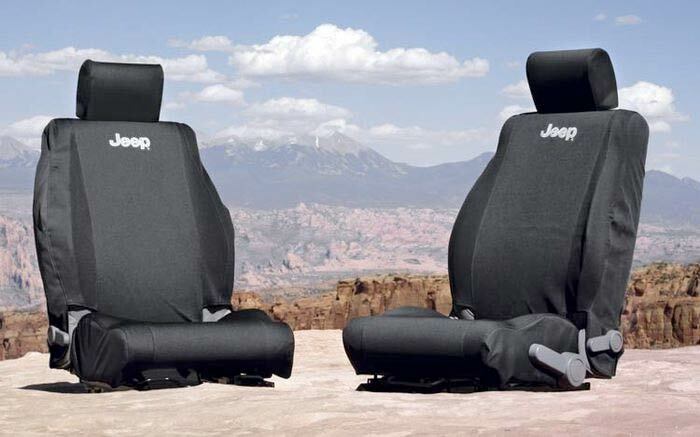 Protect your Jeep's front seats from dirt, tears and other damage with Mopar seat covers from JustforJeeps.com. 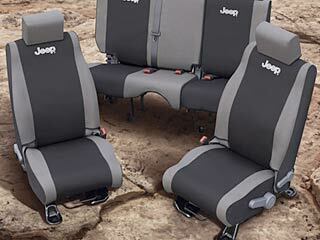 These Mopar Jeep seat covers are easy to put on and take off, and they're designed for a custom fit so they won't interfere with your seat controls. They're available in black or khaki and black, and you can choose them with or without headrest covers. Each of these Mopar seat covers features a prominent Jeep logo. Front, Black (as pictured) or Khaki and Black Wet Suit-like material, with Jeep logo. DO NOT INSTALL ON VEHICLES EQUIPPED WITH SEAT AIRBAGS. Please select Model Year and Color (if applicable) above. I bought these at first for the rear seats of my 2018 Rubicon, I liked them so much I bought the front ones/ They are pricey but great quality and fit. If you have dogs these are perfect. We got the backseat covers first, for our GSD and we liked them so much, that we got the front, as well. I bought these for my 2015 Jeep Wrangler Willy Wheeler edition. They fit and look great! I have long haired dogs that she'd often, there hair (s) will clean up easy with these covers. Look good and fit nice. Not absolutely perfect fit but very good. Purchase front and back for 2014 jk. I would recommend to a friend.